Aloha, Welcome to Hawaii. Big Wave Dave Surf School wants you to have the best experience of your life. Want to have fun, learn about the ocean, Hawaiian culture, and most importantly how to surf in Waikiki? Let us turn your surfing dream into a reality. The feeling of a ride lasts a lifetime and is one of the top ten things to do on your Hawaiian vacation. Surfing, originally known as wave-sliding or he’e nalu, is the ancient sport of Hawaiian royalty. Big Wave Dave Surf Co. is here to provide you with the best surf instruction available. We offer Group lessons, Semi-Private, and Private lessons to suit your schedule and budget. You are guaranteed to catch a wave on your first lesson. We offer Group, Semi-Private, and Private surf lessons to suit your schedule and budget. 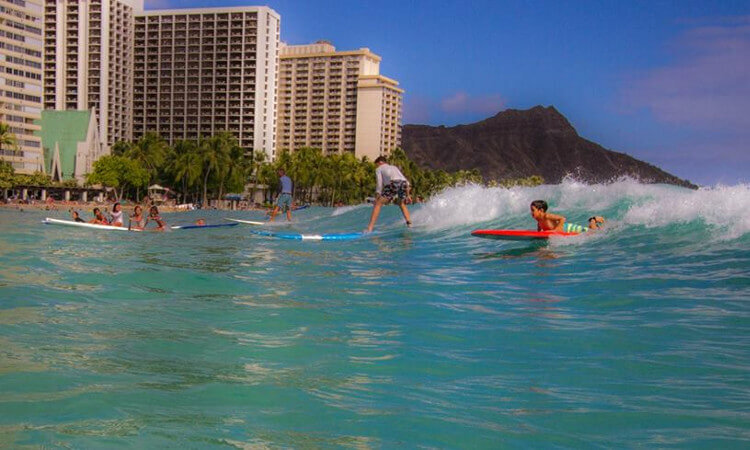 Surf lessons with Big Wave Dave in Waikiki are perfect for any level surfer–from first time beginners to intermediate or advanced surfers who want some one-on-one guidance. There are many incredible breaks off the beautiful beaches on Oahu–some world-famous surfing beaches and some hidden spots. You are guaranteed to catch a wave on your first lesson. Display price is per person for a group surf lesson. You may also book a semi-private surf lesson for $119 per person or a private surf lesson for $149 per person. This is your chance to learn how to stand up paddleboard in Hawaii, our fastest growing water sport. Big Wave Dave provides lessons in stand up paddling, and supplies the paddles and stand up paddleboards for all skill levels. We’ll teach you advanced strokes for turning and catching waves, safety on the water, safe methods of carrying your gear, basic strokes and turns, correct stances and how to use the paddle for stability. Lessons are typically started in a very shallow area, with calm water. After balance is maintained, off to the ocean to explore and catch waves. Display price is per person for a semi-private lesson for 2–3 people per instructor. You may also book a private lesson for $149 per person. There are no group option for stand up paddle lessons. – All of the equipment necessary for the lesson is included: stand up paddleboard, paddle, leash and instructor. – We are experienced with students who have special needs. – Lessons are available year round. Reservations are required; space is limited, so please book in advance. – Stand Up Paddle Board Lesson Photos available. Our outrigger canoe seats nine, plus the captain and second-captain. Once assigned a seat you will be given a role in the crew based on your size and strength. Before entering the water you will receive instruction on how to enter and exit the boat, along with details on how to paddle. Be prepared to paddle hard and listen to your Captain carefully as they shout out instructions to get the boat in the best position to ride the waves back toward the shore. Your Canoe ride can last any where from 10–45 minutes depending on the wave conditions, in between catching waves you will be able to look down on the reef area as a huge aquarium. We often see fish, turtles, and dolphins. – Outrigger Canoe Surfing is a great activity for the whole family. – We provide safety and paddling instruction before heading out on the outrigger canoe. – Life vests provided upon request. – We are experienced with riders who have special needs, please let us know at the time of your booking. – Outrigger canoe rides are available year round. – Reservations are required for outrigger canoe rides; space is limited, so please book in advance. – Photos and videos for your Outrigger Canoe Experience will be available. – Corporate groups, school organizations, team building retreats, organized outings welcome. – The outrigger canoe is one of the safest ocean vessels; it is the ONLY vessel that does not require life jackets by the US Coast Guard.